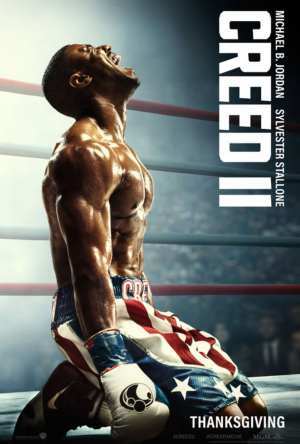 Spinoff sequel from the Rocky film series directed and co- written by Ryan Coogler which follows Apollo Creed’s on, Adonis Johnson Creed (Michael B. Jordan), who never knew his father as he died before he was born. But boxing is in his blood so Adonis heads to Philadelphia, the site of Apollo Creed’s legendary match with Rocky Balboa (Sylvester Stallone). After tracking Rocky down, Adonis asks him to be his trainer. Eventually Rocky agrees to take him on, even as the former champ is battling an opponent more deadly than any he faced in the ring. With Rocky in his corner, it isn’t long before Adonis gets his own shot at the title, but can he develop not only the drive but also the heart of a true fighter, in time to get into the ring? Adonis Johnson: I want you to train me. I need somebody solid and who else better to go to? You at least owe me that. Rocky Balboa: I can tell the way you talk, you been to school so I figure you got some brains. Why would you want to pick a fighter’s life when you don’t have to? If Apollo was around, he would tell you that, too. Adonis Johnson: Well he ain’t around. I been fighting my whole life. I ain’t got a choice. Rocky Balboa: It’s always about a choice. I was in the ring, I saw how it went down. That fight should’ve been stopped, I should have stopped it. Adonis Johnson: Maybe he wanted to go out like a fighter. Maybe, you did exactly what he wanted. Rocky Balboa: I think he’d rather be here, talking with you. Rocky Balboa: There is a resemblance. I’m usually here all the time so if you’re ever in the neighborhood, come by if you need something. Adonis Johnson: I’ll be at Mickey’s gym tomorrow. Rocky Balboa: I don’t go there. I haven’t been there in a long time. Adonis Johnson: Since we’re pretty much like family, who won the third fight? Adonis Johnson: Hey, unc! Unc! How you doing? Rocky Balboa: Did you call me unc? Adonis Johnson: Yeah, it was either that or O.G. Rocky Balboa: What’s an O.G.? Rocky Balboa: Unc is good. Rocky Balboa: So why’d you come by? You hungry? Adonis Johnson: No, I just wrapped up at the gym. Figured I’d stop by. Adonis Johnson: Maybe ask you a question. Rocky Balboa: Sure, I can do all this. Adonis Johnson: What are some drills I can do to get my hand speed up? Rocky Balboa: Some guys up there, I bet they can help you. There’s a guy there named Pete, he’s a pretty good trainer. Adonis Johnson: Yeah, but he’s with his fighter most of the time. I mostly just train myself. Rocky Balboa: Do they know you’re a creed? Adonis Johnson: I don’t go by that, I’m trying to make it on my own. My name’s Johnson. Adonis Johnson:My mom’s name. Plus, just makes life easier. Plus, you know, if you train me nobody around knows me. We could fly under the radar. They’d never know. Rocky Balboa: Yeah. I told you before, I just don’t wanna do it, kid. Adonis Johnson: That’s cool, but maybe, you know, you could just give me some drills. Adonis Johnson: Yeah, things I could do on my own. Rocky Balboa: You don’t stop, do you? You’re like a woodpecker. My God. Rocky Balboa: Alright, I got a few. But that’s it. Okay? Adonis Johnson: Yeah, Of course. Rocky Balboa: It’s a “w”. Boxing. Rocky Balboa: And that’s it. Alright? Rocky Balboa: Okay, here you go. Adonis Johnson: That is perfect. Rocky Balboa: Good luck with that. Adonis Johnson: Alright, got it. Adonis Johnson: Hold that real quick. Rocky Balboa: Wait, don’t you want this? Adonis Johnson: I got it right here. Rocky Balboa: What if you lose that thing or it breaks? Adonis Johnson: It’s already up in the cloud. Rocky Balboa: What cloud? What cloud? Rocky Balboa: Here we go, Paulie. Happy Birthday, my friend. I didn’t forget ya. Your favorite. Miss ya, pal. Rocky Balboa: Yoh, Adrian, my darling. The best of the best. Rocky Balboa: I’ll tell you, Adrian, God, it’s getting harder to walk up this hill. What does that mean? Anyway, it’s a good day today. It’s a good day, got no problems. the bills are paid. The only thing is, it’s tough to sleep at night sometimes my back. No matter what you do, it catches up to you. Anyway, shall we see what’s new in the world today? Adonis Johnson: Hey, unc! Unc. Pete Sporino: He talking to you? Rocky Balboa: Yeah. I think so, yeah. Adonis Johnson: You made it. Rocky Balboa: Yeah. Just walked by. Here I am. Pete Sporino: How you know Hollywood? Adonis Johnson: We met at the restaurant. Pete Sporino: Okay, Rock. Okay. You need anything, you let me know. Rocky Balboa: Okay. Good luck, kid. Seriously. Leo ‘The Lion’ Sporino: Thanks. Rocky Balboa: Can I talk to you a minute? Rocky Balboa: You know, I don’t even know what I’m doing here because I got other plans for my life and this wasn’t part of it. Your father was special. Tell you the truth, I don’t know if you’re special. Only you going to know that when your time is right. It ain’t going to come overnight. You’re going to take a beating, you’re going to take this, you’re going to get knocked down, you’re going to get up and you’re going to see if you got the right thing.But, you got to work hard. I swear to God, if you’re not going to do it, I’m out. Adonis Johnson: Rock, every punch I’ve ever thrown has been on my own. Nobody showed me how to do this. I’m ready. Rocky Balboa: Come on. Let’s do this. Step into my office. Rocky Balboa: I am serious. This is old school. You should be able to grab one of these birds. Rocky Balboa: Yeah, in your dreams. Rocky Balboa: You see this guy staring back at you? That’s your toughest opponent. I believe that’s true in the ring and I think that’s true in life. Adonis Johnson: Every move that I make, every punch that I throw, everything’s going to be compared to him. Rocky Balboa: Everything I got has moved on and I’m here. Adonis Johnson: [to Rocky] You standing here crying about nobody’s around for you. I’m here for you everyday! I’m standing right in front of you! Rocky Balboa: [to Adonis] Bring back everything that’s ever hurt you, all the pain you had inside. They don’t know what we’ve been through. You belong here! Rocky Balboa: Time, you know, takes everybody out. It’s undefeated. Rocky Balboa: One step at a time. One punch at a time. One round at a time. Rocky Balboa: As long as you’re talking, you’re not listening. Adonis Johnson: I can train at your house. Rocky Balboa: No, I don’t know, nobody’s been to my house in a long time you might be uncomfortable there. Adonis Johnson: What, do you walk around naked? 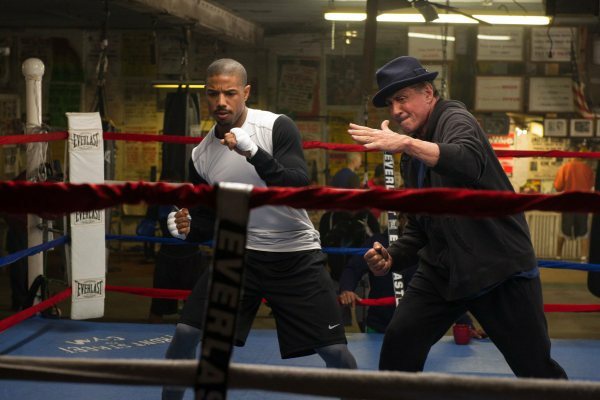 Creed is directed by Ryan Coogler and is the newest film in the Rocky franchise. This film is part of the new movement of legacyquels (such as Star Wars: The Force Awakens). It stars Michael B Jordan and Sylvester Stallone, it follows Adonis Creed (Jordan) who is the son from an affair that Apollo Creed had with a woman who passed away. Adonis spent time in Juvenile detention centers and in foster care until Apollo’s wife found him and took him in. Adonis wants to live up to his father’s legacy so he tracks down Rocky Balboa (Stallone) asking him to train him. This leads to Adonis to slowly gain publicity until the number one pound for pound boxer in the world challenges him to a fight and of course Adonis jumps at this opportunity. When I saw this film the first time I had never seen a Rocky film and then I saw it a second time after I saw I had seen the first Rocky film. My thoughts did not change from the first to the second time. I usually talk about actors first but this time I feel it necessary to go to the incredible director: Ryan Coogler. This film is so amazingly directed; the boxing scenes are mind blowing they are definitely the best boxing ever in film. They are so realistic it actually looks like people are throwing real punches and actually hurting each other and I think that is because they are. I’m not sure how much of the boxing Jordan did but it looks like he is doing it all! After seeing the first Rocky and being a bit underwhelmed by the ‘amazing’ training montage I have heard about, this film delivers several remarkable montages set to an astonishing score that gave me chills both times of seeing it. The film is also written by Ryan Coogler and he did the same kind of job with that as he did with the directing. Brilliantly written it is also a very good story and not just a rip off of the original Rocky. This film has originality round every corner, I especially love top trump like cards that show each boxer’s credentials that pop up every time you meet a new boxer. The final opponent of Adonis, Ricky Conlan, played by Tony Bellew, is very well portrayed and has a fun personality. I’ve already talked about the score for the montages and that has to be said for the entire film it is basically the same piece of music but just altered and it really worked. Along with an awesome score there is a brilliant soundtrack with songs that fit the film perfectly. This is a very well-acted film. Stallone has already won a Golden Globe (how much the Golden Globes matters is up for debate but he still won it) and he is probably the front runner for the Oscar, I think maybe Tom Hardy might deserve it a bit more but I wouldn’t oppose to Stallone to winning it as he does a great job in Creed. He is called upon to actually do some acting in this film and he established an emotional connection with me and made my eyes water a tiny bit. I am not usually a fan of Stallone but in this film he was very likeable, even if he does make a couple of stupid clichéd old people jokes. Michael B Jordan is amazing. You actually believe that he could be a boxer and you believe that he can throw and take punches in the ring. He definitely shows his spectrum of acting in the film. Just like the director he is going somewhere. This film showcases two of the brightest sparks in the world of film for the future. This film does have some faults; they may be few but they are still there. Tessa Thompson is great in this film don’t get me wrong but I actually cannot remember what her name is, I think it might be Bianca (I added that bit in after thinking really hard about it). She is just a bit forgettable and hear progressive hearing loss is cute and all I guess. She loves music but one day she won’t be able to hear it but in the context of the movie I’m not 100% sure it was needed. I feel like people are harsh to Adonis for no reason really. For example, it is said that Adonis has fought 15 fights, or there abouts, and has knocked out every person he goes up against and then he goes to find a trainer and this guy says that he doesn’t want to train him because basically he is from privilege; he only trains kids from hard backgrounds because they have to fight to get accepted. This alone is stupid considering Adonis’ mother died and his father died before he was born, if that isn’t a troubled childhood I don’t know what is. Also he is denied training because he can’t defeat the second pound for pound boxer in the world, someone who has self-trained himself from when he was a boy cannot beat one of the best boxers in the world and he is laughed out of the gym. That’s just a bit harsh. I would’ve also liked to have seen one more boxing fight, just because they were so good! It could have replaced a scene with Michael B. Jordan and Tessa Thompson or just made the film longer as it definitely was nowhere near being too long. I know I said Stallone is great in this film but there are some sparse scenes where I couldn’t really understand what he was saying. I loved this movie and I am not a sports films fan at all and yet I found myself adoring this film I cannot wait to get the DVD and experience it all over again. There has been lots of talk of Oscar snubs this year and I think a major one that people have not been talking about is Creed, I definitely think this film is better than Bridge of Spies. I also got the impression that Creed was received better critically than Bridge of Spies. This film did deserve a nomination I don’t know whether I would’ve wanted it to win but I still would’ve liked it to be mentioned. I’ve run out of positive adjectives to describe this film so I’m going to go with a bit of a plain one but in this case I think it’s perfect. This is just a really ‘nice film’ I thoroughly enjoyed it both times of seeing it and I would highly recommend it. I’ve already watched most of the movies this January in early releases, and Creed was one of the movies I’d watched. And no, I’m not calling it by that silly Creed: The Rocky Legacy title they’re putting on the UK posters. I haven’t seen any of the Rocky movies, except for of course… Creed. This was a great movie and I really enjoyed it from start-to-finish. Everything including the score was just so epic. I got to watch a couple of movies earlier because of their U.S release dates, and I in fact live in the United Kingdom. Michael B. Jordan does a good job at playing Adonis Johnson, who is the love child of Apollo Creed, the best buddy of Rocky Balboa. I really love the whole media aspect and portrayal of fame and success in the movie. Oh, yeah, and Sly… Sylvester Stallone reprises his role as Rocky Balboa and the turn they take with his character is cool and I’m excited to see where they take it. Maybe they follow the roots of the classic Rocky franchise and make at least 5 sequels (Remember, Rocky 5 doesn’t count) to this. Oh, and I did watch parts of the Rocky sequels, specifically Rocky 4, 3 and 2, so I recommend Creed to fans of boxing like me, movies in general and the fans of the Rocky movies. I’ll give this movie a 5 out of 5 stars for Creed. Next, I will be reviewing Goosebumps, which will be released in February over here is the U.K., but in the USA is has already been released. Look forward to the feedback on this review.